Sleep Apnea Treatment: What are Your Options? You’ve been snoring loudly. And you’ve been sleepy during the day, even after a full night’s rest. You think you might have sleep apnea. So what are your treatment options at our Fairfax dental office? The first thing you should know is that you don’t have to suffer! Sleep apnea means you stop breathing while you sleep. And, yes, this is potentially a serious condition. Without sufficient sleep, your body and brain won’t function at the level you need to get through your day. This means you put yourself at risk of injury and other health problems. But we can help you. We’ll go over your treatment options. But first, we want to make sure you understand this problem and why it’s one you shouldn’t ignore. Sleep apnea is a chronic condition that disrupts your sleep. Sleep apnea is a common disorder, one that affects more than 18 million U.S. adults, according to the American Academy of American Sleep Medicine. 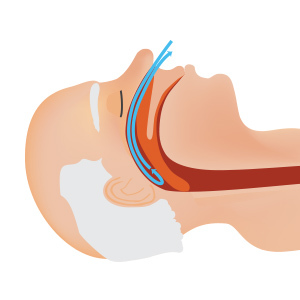 While sleeping, people with sleep apnea will have one or more pauses in breathing and shallow breaths. These pauses last from a few seconds to minutes, and may occur 30 times or more per hour. When your breathing pauses or becomes shallow, you can move out of deep sleep and into light sleep, making the quality of your sleep poor. And as a result, you’ll be tired during the day. Oftentimes, sleep apnea goes undiagnosed. The only way many people become aware they have a problem is because their sleeping partner complains they snore loudly. Other symptoms of sleep apnea include drowsiness, irritability, fatigue, forgetfulness, falling asleep at inappropriate times, or suddenly waking up while choking, coughing, or gasping. Sleep apnea is more common in males and in people who over over the age of 65, but it can occur at any age. Obstructive sleep apnea. This is the more common type. It occurs when the throat muscles relax. Central sleep apnea. This occurs when your brain doesn’t send proper signals to the muscles that control breathing. You may awaken with shortness of breath or have difficulty getting to sleep or staying asleep.The most common cause of central sleep apnea is heart failure or stroke. 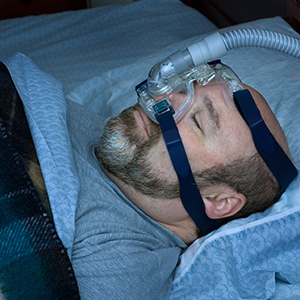 People with this type of sleep apnea may remember awakening. Another important point is that snoring typically doesn’t happen with central sleep apnea. Complex sleep apnea. This is a combination of obstructive sleep apnea and central sleep apnea. So how do you know if it’s just snoring or it’s sleep apnea? The easiest sign is to think about how you feel during the day. Are you tired and forgetful? Then, you might have sleep apnea and should go to a doctor and get professional help. Key Takeaway: Sleep apnea is a common sleeping disorder. People with this condition have pauses and shallow breathing while they sleep, which causes their quality of sleep to be poor. Ongoing sleep deprivation results in daytime sleepiness, slow reflexes, poor concentration, and an increased risk of accidents. In fact, 5,000 to 6,000 fatal car crashes may be caused by drowsy drivers, according to the National Heart, Lung, and Blood Institute. Sleep apnea can also lead to serious health problems over time, including diabetes, high blood pressure, heart disease, stroke, and weight gain. And it can make irregular heartbeats more likely. Another thing to think about is the psychological effects of sleep apnea. Studies report an increased risk of depression for people with this sleeping disorder. Also, nightmares may increase and post-traumatic stress disorder can get worse. And finally, your loud snoring can negatively affect the quality of sleep for your sleeping partner as well. Sometimes, this situation can even disrupt your relationship. As you can see, sleep apnea is not something you should ignore. If you think you might have sleep apnea, it’s important to see a doctor. Treatment is necessary to avoid heart problems and other health complications. Key Takeaway: If you suspect you have sleep apnea, you should seek professional treatment. Untreated, sleep apnea can lead to daytime sleepiness, an increased risk of accidents, and many other serious health problems. With the proper treatment, you can control your symptoms of sleep apnea. Plus, you can get your sleep back on track and enjoy feeling refreshed and awake during the day. You should be aware that, in most cases, you will need to continue to manage your sleep apnea long term, probably for the rest of your life. If you don’t, your symptoms are likely to come back and your sleep will suffer. Continuous positive airway pressure is the most common treatment for moderate to severe sleep apnea in adults. These types of machines use a mask that fits over your mouth and nose, or only over your nose. Unfortunately, these devices take some time to get used to. Also, at least half the people who try CPAP don’t stick with the treatment, according to research. That’s why, at our dentist office, we recommend oral appliances to our patients (see more below). Oral appliances, or mouthpieces, help keep your airways open while you sleep. These dental devices look like mouth guards worn by sports players. The American Academy of Sleep Medicine recommends these for people with mild-to-moderate obstructive sleep apnea who are not candidates for CPAP or who have not been helped by it (possibly because they didn’t use it correctly). The great thing about oral appliances is that there are few or no complications. Also, these devices are comfortable (unlike CPAP machines) and will not cause you to lose sleep. At our dentist office, we want you to get the best sleep possible. That’s why we prefer this method of sleep apnea treatment. People who snore loudly but don’t have sleep apnea may also benefit from an oral appliance to lessen and reduce their snoring. You may have seen ads for mouthpieces you can buy directly. We do not recommend these because they are not studied by researchers and may not treat your sleep apnea effectively. When you come to us for sleep apnea treatment, we will custom fit you for an oral appliance made just for you. And we’ll make sure it works for you. If you have mild sleep apnea, changes in daily activities and habits should be able to help relieve your symptoms. Avoiding alcohol (four hours before you sleep) and avoiding medicines that make you sleepy. Both of these make it harder for your throat to stay open while you sleep. Lose weight if you’re overweight or obese. Even losing 10 percent of body weight can have a big effect on sleep apnea symptoms, according to the American College of Physicians. And losing a significant amount of weight may cure your problem. Sleep on your side instead of on your back to help keep your throat open. You can find shirts and pillows made to help you sleep on your side if you find this difficult. If none of the above works, surgery may be recommended. An operation is done to widen the breathing passages. There is, however, limited evidence to support the effectiveness of surgery for sleep apnea. Our dentist office favors minimally-invasive options and will not advise you to get surgery unless nothing else is working and there are no other options. Key Takeaway: Sleep apnea treatment options include CPAP, oral appliances, lifestyle changes, and surgery. We recommend oral appliances because they are comfortable and easy to wear. Smiles at Fairfax Corner can help treat your sleep apnea for The Rest of Your Life. So you think you have sleep apnea? Then you want to see a doctor who is experienced in treating sleep apnea, such as our Dr. Riaz Rayek. If you’re in the Fairfax, VA, area, Smiles at Fairfax Corner can help you. Our sleep apnea and snoring patients have found great success with oral appliances. We would be happy to answer your questions and create a comfortable, easy-to-wear appliance custom-fitted for your mouth. Don’t keep suffering from this potentially serious sleep disorder! Please call (703) 997-0928today to schedule an appointment with our office.